FAYETTEVILLE, N.C. – The final meetings of the Smoky Mountain Showdown took Fayetteville back to Tennessee for a battle for Fifth Place. Knoxville would come away with three of four points, and hold a one-point lead over the Marksmen in the standings. The intense-weekend series would bring the best out of Fayetteville, as they played well in a tough environment to end up taking the season series, 4-3-1. Included in that notch is a noteworthy 3-1-1 record at the Knoxville Civic Coliseum. A late-scoring Friday night game would be too late for Fayetteville in a 3-2 loss, while it would take an OT-forcing comeback after a 2-0 lead in Saturday night’s win, 4-3. Fayetteville will head into a three-in-three down in Pensacola – currently holding the final playoff spot with a sweep of Macon – with some momentum and hunger. With only SIX POINTS separating third-place Huntsville and sixth-place Fayetteville, the weekend could bring about a lot of movement if all goes well. Before we look ahead to the trip to The Hangar, let’s take a look back at three performances that made the difference. These are the Three Stars of Week 17. Dillon Kelley put up a solid effort in his one-start of the weekend. Though he didn’t come away with the victory in a 3-2 loss, he guarded the Marksmen post well in 27-save night. While he played well in this game and helped push the team in the right direction, it was not this performance that helped give him the Third Star nod. On Saturday night, Nathan Perry started and put up a really great effort against a peppering Ice Bears team. With over 30 shots by the time the second period ended, Perry had allowed just two goals in a close contest. That’s when Kelley came skating out of the locker room in Period Three. This was not due to Perry being pulled by the coaches, but rather due to a discomfort that was nagging his leg after being ran into during the second – forcing Kelley to come in cold in a intense environment in a tied-affair. Kelley’s confidence was there from the start, and allowed just a goal in a period + one minute (overtime). His six-save performance allowed the Marksmen offense to get comfortable, and finish the game out strong with an overtime win. The goaltending core of the Marksmen is arguably one of the most solid in the SPHL. Kelley’s ability to come in and give the Marksmen everything they needed to win is admirable, and his performance on the weekend sparks plenty of confidence in this team heading into Florida against a hot Pensacola team. The shoes that McCloy was tasked with filling this weekend were high-scoring to say the least, as he was put in Bowen’s spot on the top line in game one. McCloy’s point-performance was a notable one, and he was a gnat around the puck all weekend, making his presence known when he was needed. With a tip-goal to start the Marksmen scoring on Friday night, McCloy would give the Marksmen life in a contest they’d had frustration finding the back of the net in. His pair of assists in Saturday night’s OT win – including assisting on the game-winner – would help push the Marksmen over to the win column on the weekend. 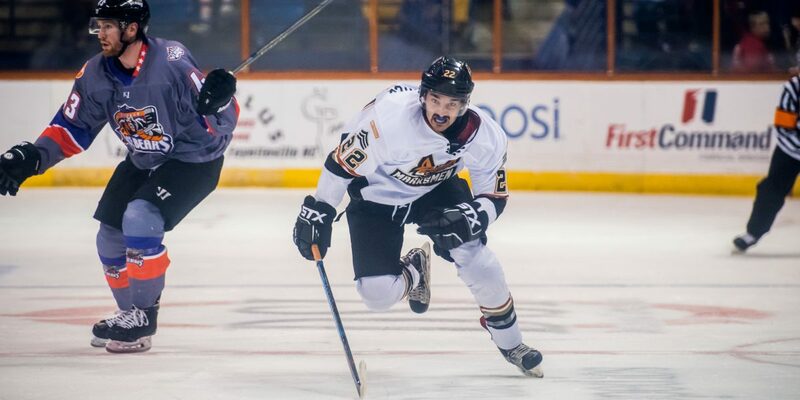 The role of McCloy on this Marksmen team is finding its shape more each week, as McCloy’s skill has made him a variable asset for the offense, where he’s able to work as a talented puck-handler, shooter, and passer. While not all of his performance was rewarded this weekend, it is surely a sign of what we can expect in a battle in the Panhandle this weekend. You just had a feeling about Darren McCormick this weekend. There was some kind of fire and jump in the way that he played, that you knew when he struck, it was going to be an impacting moment. McCormick made sure that those echoes of expectations were met, as he finally made his mark in the closing moments of Saturday’s show. Pushing the puck up the ice off a faceoff loss, McCormick and Pryce went for a two-on-one, forced himself to the front of the net, around goaltender Hayden Stewart, and into the back of the net to tie things up in the late third. He wasn’t done yet – as he found the puck in the neutral-zone in overtime, sped himself up the left-wing side, and wrapped around the net for the game-winning goal. These would go by as his 15th and 16th goals of the season, and give him a much needed monkey-off-his-back. There were so many occurrences during the weekend where it looked as though McCormick would strike, including a breakaway off-the-post in the second period of game one. With two massive goals in game two, this should spark the scoring bug back in McCormick, especially heading to a game in Pensacola that could very well be a high-scoring affair. The Marksmen are back home Thursday, February 21 for our School Day Game at 10 A.M. Tickets are available now by calling the Marksmen office at (910) 321-0123 or clicking on the date above! Saturday, February 23 is STAR WARS NIGHT, where we’ll be skating out in exclusive Stormtrooper jerseys, and have the 501st Legion out. Stay tuned for ticket specials. Sunday, February 24 is our second-to-last SUNDAY FUNDAY game, where all kids get in FREE (with purchase of an adult ticket), and we’ll have a post-game skate with the Marksmen!